When creating the most flattering styles for our clients we need to consider the following points. 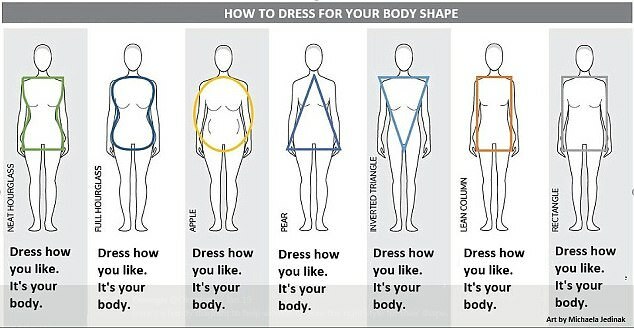 They first is the body shaper, the science of understanding the individual body shape. Inverted Triangle, Lean Column, Rectangle, Apple, Neat hour glass, Full Hour Glass. These are the 7 body shapes and we all fit into one of the 7 body shapes. With this body shapes comes do’s and don’ts. For example, if you are an inverted triangle you want to choose a narrow-elongated neckline, if you are a triangle you want a wider neckline. The neckline style should bring balance to the shape of your body. Large, Normal and small busts will all contribute to your neckline options. Ladies with small busts can wear high, busy and wide necklines. However, you should shy away from designs meant to draw the eyes to the cleavage such as plunging neckline. This will flatten the chest even more. Large busts should wear simple neat necklines staying clear of ruffles. Also, rouging and high necklines with a lot of bulk will cause your busts to look fuller. Shoulders provide a frame to your neckline. Regular, Broad, Narrow or Sloping. Ladies with slim shoulders can wear wide flattering necklines. If you have Broad shoulders a wide-necklines will add width. So best avoided. Those with sloping shoulders should avoid strapless or halter necks and instead look at wider necklines like boat necklines. A mistake often made by women is that they do not choose clothes to suit their height. Shorter women may choose clothes which are too long for them or have too much fabric thus drowning their figure. A different style will suit a shorter lady with large hips to a shorter lady who is very slim. A taller lady may need to cut up the body with a belt detail for example to give proportion. Again, there fits will vary for a very slim tall lady to that of a tall lady with broad shoulders and a fuller bust.